‘Sign of things to come in 2019 Lok Sabha elections’, Gehlot calls on anti-BJP parties to join hands, Sachin Pilot credits Rahul Gandhi. New Delhi: Voters had clearly rejected the BJP in what was an indication of things to come in 2019, Congress leaders said on Tuesday as trends showed the party ahead in Chhattisgarh and Rajasthan and locked in a tantalizing, see-saw battle in Madhya Pradesh. The party is likely to get an absolute majority in Chhattisgarh and is reaching the simple majority mark in Rajasthan while going neck-and-neck in Madhya Pradesh, according to trends on the Election Commission website. The BJP is in power in all three Hindi heartland states. 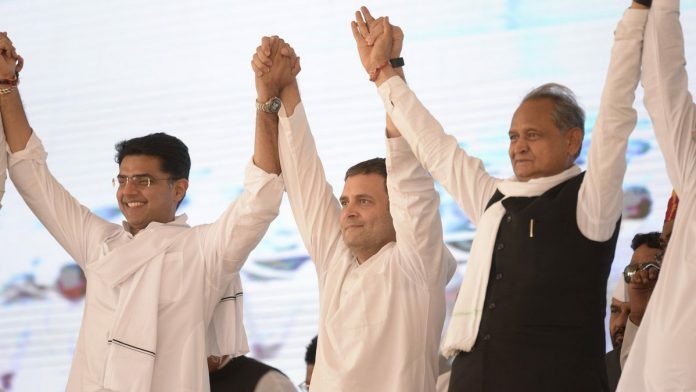 “We are confident that the Congress will get a clear majority and will form government in Rajasthan,” senior Congress leader Ashok Gehlot told PTI. He said the decision on the chief minister’s post will be taken by party president Rahul Gandhi. Gehlot also credited Gandhi with the party’s good performance in all the five states, saying he raised issues concerning the public on which the BJP and Prime Minister Narendra Modi did not have any answers. “This is a clear indication of things to come in 2019. The BJP made tall promises, but could not fulfil them. The ‘Achhe Din’ they spoke about never came,” he told reporters in Jaipur. The former Rajasthan chief minister said the way Gandhi led the campaign in Gujarat, taking on PM Modi on his home turf, spoke a lot. He said the public is suffering under the BJP rule and Gandhi raised key issues concerning the people because of which Modi’s “graph came down”. Rajasthan Congress chief Sachin Pilot, who was tasked with rebuilding the party in the state after a drubbing in the 2013 Assembly elections, exuded confidence that it will form the government there. He also said Gandhi as well as the party’s MLAs will decide on who will be the chief minister. Pilot said the Congress was marching towards victory in Rajasthan, Chhattisgarh and Madhya Pradesh and the trend would continue in the future in the rest of India. “We are moving towards a full majority and I am sure it will be clear once final numbers are in, but still we welcome all like-minded and anti-BJP parties to support us and we are in touch…I am certain that we will come to power in Rajasthan. I am hopeful that like minded parties against the BJP will come together,” he told reporters in Jaipur. Pilot recalled that exactly a year ago Gandhi became the chief of the party. “What could be a better gift to him than victory in these states,” he said. In Madhya Pradesh, party leader Jyotiraditya Scindia said trends reflect people’s desire for change, while state Congress chief Kamal Nath exuded confidence that they will form the government in the state. The initial vote count suggested the Congress and the BJP were neck and neck in Madhya Pradesh, while Gandhi’s party had taken the lead in Chhattisgarh and Rajasthan. Scindia, who spearheaded the Congress campaign in Madhya Pradesh, said he was very confident that the Congress would form the government in the state. Asked about posters being put up that Kamal Nath would be CM, Scindia said, “Let us not put the cart before the horse. Let us wait for the verdict”.